Our staff, your fitness center. It's a match made in heaven. We’re pretty passionate about people because staffing is OUR business. 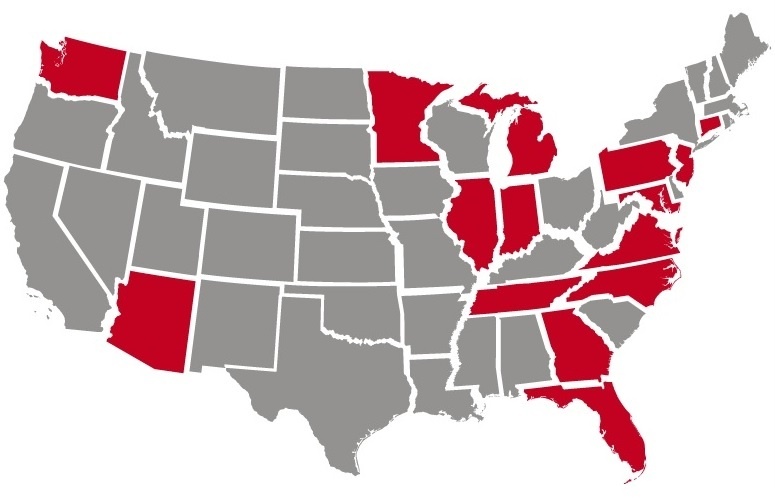 We have more than 60 full time staff at work in client fitness centers in 15 states. The map below shows our current footprint in red, but don't let where we aren't located scare you. We are adept at setting up business in a new state. In fact, since 2009, we've added almost half of the states below. Talk to some of our clients (look below the map), and they'll tell you we're responsive, easy to work with and exceptionally hard working. As a regular member of our fitness center for more than nine years, I know on a daily basis how fortunate we are to have our NIFS staff. They provide a world-class level of service, knowledge, and commitment. Besides everything they bring to their work as professionals, they are also incredibly wonderful people who make a very meaningful difference for us as members." We are honored to support the fitness programs for these and other clients. to any good fitness program. But believe it or not, our amazing staff isn't the only reason to work with us. Download our quick read to find out the advantages you gain when you work with NIFS.